Without your hip flexors, you would be unable to bend forward or lift your knees inward to your chest. This group of flexors, which includes your thigh, inner thigh and iliopsoas muscles, gives you the ability to move with elasticity. Because of this, it is very important to perform exercises so that the area remains flexible. This is especially essential to your health if you have a job involving a lot of desk time. Often, exercises that work on your hip flexors also benefit your abs. For instance, decline sit-ups targets and strengthens both areas. Start by lying on a decline bench with your ankles hooked under the arm support. With a straight back, lift your body as you do a sit-up. Slowly lower yourself back down in a controlled manner, tightening your ab muscles as you move back to the original position. As you get stronger, you can add weight by holding a medicine ball to your chest as you sit-up. Repeat 10-15 times for 3 sets. One of the best hip flexor exercises are leg lifts. They position your body so that you strengthen both your lower abs and hips. Start by lying on the floor with your hands to your sides. Use your arms and hands to support you as you lift your legs straight up until they reach a 90 degree angle. In a controlled motion, slowly lower your legs back down to the original position but stopping just short of touching the floor. Keep repeating for 10 reps per set, resting in between for a total of 3 sets. 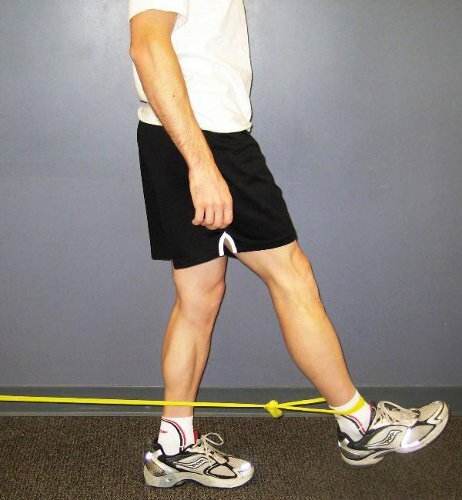 To perform this exercise, you need to use an ankle strap. This will provide the resistance you need to strengthen your hip flexors. Start by attaching a strap to your lower left leg with the other end securely attached to a permanent or solid structure. Lift your foot from the ground, with your knee forward. Continue this movement until your thigh area is aligned with the floor. Slowly, in a controlled manner, lower your left leg back to the original position. Repeat 10 times and then switch legs. Using an exercise ball to do knee crunches not only strengthens your hip flexors, but also takes some of the pressure off other areas of your body. Start with hands at shoulder width with palms on the floor. Lift your legs and hips so your shins are on top of the exercise ball. With your back straight, pull your knees to your chest as the ball rolls with the movement. Stretch your legs out to the original position. Elbow instep lunges are one of the hip flexor exercises that work out your glutes and thighs simultaneously. Start by standing with your feet together and arms hanging to the sides. Take a step with your left foot and bend your knee forward while lowering into a lunge position. Place your right hand flat on the ground while placing your left elbow on your left thigh. Slowly move into the original position and repeat on the other side. Alternate between sides for a total of 10 times each side. This exercise is more of a stretch and can be performed at the beginning or end of your workout. It affects the muscles of your lower back, thighs and hips. Start by sitting on the floor with abs pulled in and your back straight. Place the bottom of your feet together so they are facing each other and are in front of you. Your knees will naturally bend to the sides. Pull your heels inward, allowing your knees to drop closer to the ground. Hold position for 15-30 second. Repeat 3-4 times. You can modify this position to match your flexibility. Do not overdo it or you can cause damage to your hip flexors. Start with your body in the plank position. Lift your right foot off the ground, sliding it in front of you so your knee ends up bent on ground near your right hand and your foot next to your left hand. Slide your left leg backwards, ensuring your hips are properly aligned. Lower your body onto your elbows, going as far to the ground as you can without hurting yourself. Hold your chest up while you feel the stretch for 10-20 seconds. A bridge pose is a great way to stretch your hip flexors while strengthening the muscles in that area of the body. Start by lying on the floor with your back to the ground. With your feet flat to the floor, bend your knees until you almost touch the heels of your feet with your fingers. Pushing with your heels, raise your hips upwards and off the ground. Hold for 5-10 seconds, then repeat up to 10 times. One of the hip flexor exercises that promote blood flow while working to stabilize your muscles is the foam roll away exercise. It loosens your flexors while improving your range of motion. Start by kneeling on the floor with a foam roller in front of your knees. Lean forward and use your hands to walk your body out parallel to the ground. Turn your body to the side you want to exercise, keeping the leg slightly raised while extended. Make sure this is the side you want to work on with the foam roller if you are only targeting a specific spot. Roll your hip and leg up and down the roller for about 30 seconds. Repeat on the other side. For a deeper massage, roll on roller for up to two minutes. Hanging knee raises are considered beneficial hip flexor exercises that also target your ab muscles. 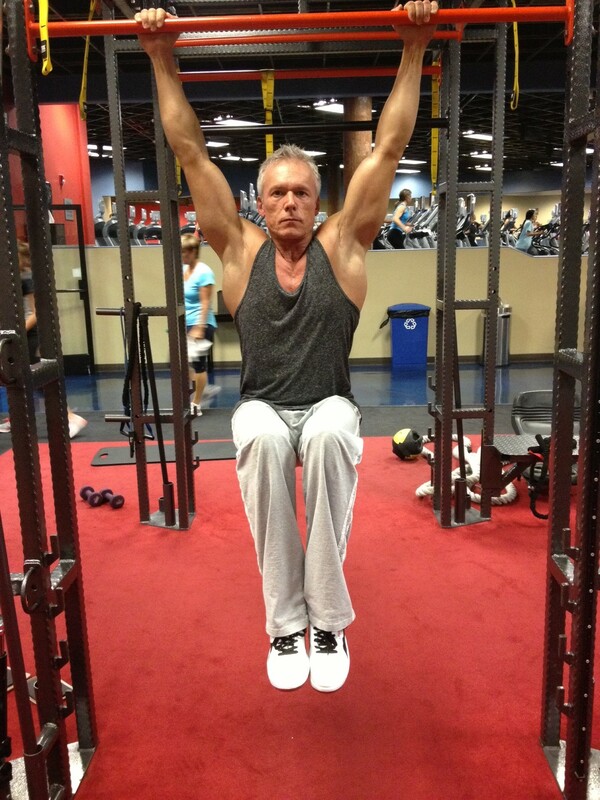 Begin by hanging from extended arms from a pull—up bar while holding with a medium grip. Flexing and tightening the core of your abs, pull your knees in to your chest while lifting your elbows to a 90 degree angle. Hold the position for a few seconds before lowering your legs to the original position. While marching in place doesn't seem like it would accomplish much, when done right it is a great exercise for your hip flexors. Start by standing straight with legs together. Keeping one foot firmly on the ground, raise the other at the knee just to right before hip height. Move from one side to the other, repeating the same motions on each side, just as if you were marching down the street but in this case you are marching in place. Keep your arms relaxed to the sides. Continue the march for 45 seconds. Repeat a few times as directed.